without affecting other objects. Local colors are the easiest and best method for simple documents that use relatively few colors. Named and Theme colors can be used repeatedly in the document (they are like styles in a word processor). Any edits you make to a Named or Themed color are immediately reflected on all objects and parts of the document that use that color. You can also copy Theme colors between documents. The Theme colors in most templates are consistently named so when you import elements from different themes colors are matched perfectly. Let’s revisit the Color Line and look at the identifying markers that tell us the color attributes on the current document. 1. The Named (Theme) Colors (if present in the document). 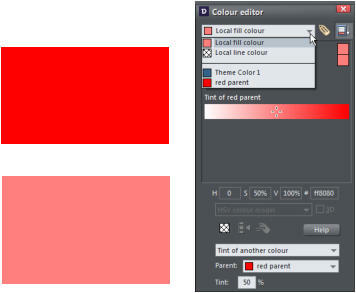 Named colors are used to give templates and designs theme colors, so that the color scheme of a design can easily be changed without editing every object in it individually. 2. Linked Colors are represented differently on the color line by smaller rounded rectangles, so it's much easier to distinguish which are normal independent Named Colors and which are linked to a parent. 3. Palette colors: The 46 pre-defined palette colors comprise 5 shades of 7 standard hues and 10 shades of gray, black and white. Palette colors are not editable (i.e they are not Named Colors) and are designed as a simple, limited selection of colors to apply to objects (either by dragging on to the object or clicking). If your document contains spot colors, they appear on the Color Line (and in the Color Gallery) as circles. Little markers in the color icons show which of the named colors (if any) or palette colors have been applied to the selected object(s). Diamond markers show the colors used by the selected objects. A diamond in the top-left corner indicates the fill color, in the top-right corner indicates the line color. Cross-shaped markers show the current color attributes if there are no objects selected. A cross in the top-left corner indicates the fill color, in the top-right corner indicates the line color. Triangular markers show the colors of a fill type if you have applied one (linear, circular, elliptical, etc). This works also when using the eye-dropper color picker. The color line markers update immediately and indicate the color of the object under the eye-dropper as you're dragging around. It's recommended to create a named color if you want to use the same color in different parts of your document and it’s especially useful, if there's a chance you might want to change that color in future. When you edit a named color, all objects that use this color are automatically and immediately updated to show the new color across all pages of your document. 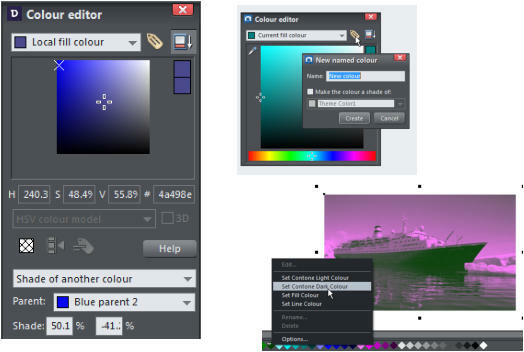 To do this, select an object whose color you want to use and then open the Color Editor ('Ctrl + E') and click the New named color icon (the label icon as shown below). 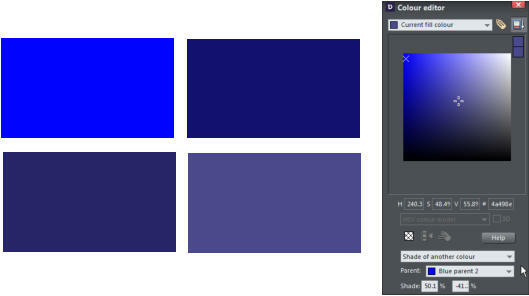 Then give the color a suitable name and click ‘Create’. You will see the new color added to the Color Line. Creating a new Named color You can now apply this color to any object in the usual way, by drag-dropping it from the Color Line or just clicking (or right clicking to use it as a line color) to apply as the fill color. In addition to the normal stand-alone colors that you apply to objects, you can also define colors that are linked to another color, so that, when the parent color changes the linked color will change as well. There are three ways you can link a color to its parent - Tints, Shades, and Linked colors. These are very powerful techniques that allow, for example, single-click re-coloring of complex shaded drawings. The parent color of tints, shades and linked colors needs to be a named color, so that when you change the parent color, the tint will change as well. So, if necessary, first create a named color. Select the object or objects to which you want to apply the new color and open the Color Editor with the advanced options showing. 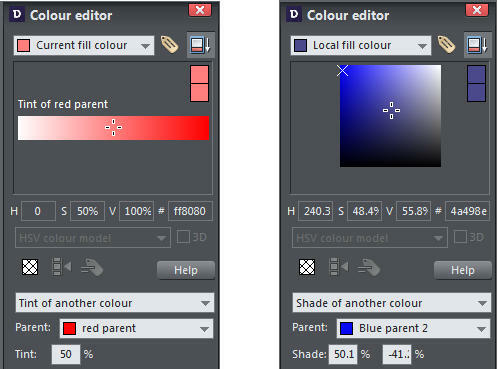 Select the 'normal color' drop-down menu and select the Tint, Shade, or Linked option. From the Parent dropdown menu, select the named color that you want this color to be linked to then adjust the Tint, Shade or Linked color on the top section of the color editor. On the left the new color is a tint so the editor provides only paler tints of the parent color. On the right, the new color is a shade, so you can choose any lighter or darker shades of the parent color. If you want to use this color in many places in the document it's recommended that you also make this a Named Color, so it appears on the Color Line, for easy picking. Just click on the New Named Color label icon on the top of the Color Editor and give it a name. It will now appear on the Color Line where you can pick it for use on other objects. The key point of using tints, shades and linked colors is that they track any changes to the parent color. To see this working try editing the Named color that is the parent (drag it from the Color Line to the Color Editor and alter the color). You will see the objects with the tint, shade or linked color change in sync with the parent. Tip: Be careful not to edit the color of objects on the page to which you've applied Named, Tints, Shades, or Linked colors as this will change them to Local colors. Many of the web themes offered in the Designs Gallery of Xara Web Designer and Xara Designer Pro include alternative color schemes which can easily be applied to websites that use the same theme, to transform the color scheme instantly. The color schemes are in the Designs Gallery in each theme folder, after all the page layouts and separate graphic elements that make up the theme. They all have 'Color scheme' in their titles, so are easily identified. To apply a new color scheme to your website, simply drag the scheme from the Designs Gallery and drop it on your web page. One of the color schemes matches the default colors used by that theme which allows you to easily return to the original colors if you prefer, after experimenting with the alternate schemes. Of course, you don't need to use the provided color schemes to re-color your website. You can customize the theme colors yourself and choose a combination of colors that you think work well together. With a photo or bitmap selected click on the white color patch to convert the image to grayscale (black and white). This is called a 'contone' - a continuous tone from black to white, or sometimes called a 'duotone'. You can also right click on the image then select 'Contone' > Make black and white. 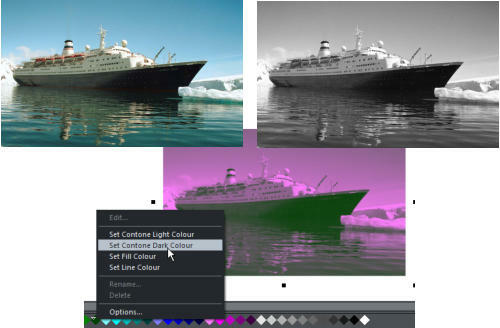 To add a color just click on a color on the Color Line to apply that color to the photo or bitmap. You can set both contone colors via the Color Line context menu - right click on the Color Line to display the context menu then apply the selected color as either the light or dark color. You can also use the color editor to select any color as either the light or dark contone colour. Right click the photo and choose Contone > Light to display the color editor ('Ctrl + E'). 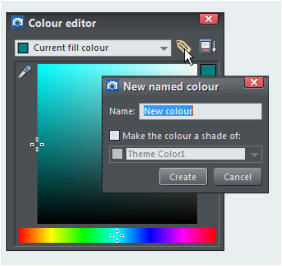 Select the light or dark contone from the dropdown menu at the top of the color editor. Black and white Image and image with the light color set to pink and the dark color set to green Restore the original color of a photo by clicking the cross-hatched 'no color' patch on the left of the Color Line, or right clicking on it and selecting the 'Restore color' option. Xara Photo and Graphic Designer is a high-powered general purpose graphics creation tool, able to create graphic designs of all types, from web graphics to page layouts such as posters and flyers, cartoons, and the most complex illustrations. Xara Web Designer is an ideal choice for novices as well as professional designers, infact, anyone wanting a high quality website, without the need to know HTML coding, scripting or the usual technical jargon. Xara Designer Pro is the ultimate all-in-one creative software, that provides powerful vector illustration, photo editing, page layout and website design, in one unrivalled WYSIWYG design tool. Download the free trial of Xara Photo & Graphic Designer and/or Xara Web Designer or Xara Designer Pro and give it a go! Copyright © 2016 Xara Group Limited, a MAGIX company. Let’s revisit the Color Line and look at the identifying markers that tell us the color attributes on the current document. 1. 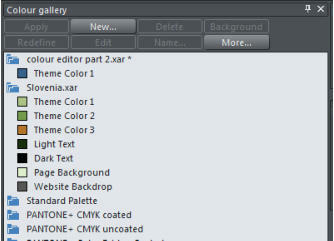 The Named (Theme) Colors (if present in the document). Named colors are used to give templates and designs theme colors, so that the color scheme of a design can easily be changed without editing every object in it individually. 2. Linked Colors are represented differently on the color line by smaller rounded rectangles, so it's much easier to distinguish which are normal independent Named Colors and which are linked to a parent. 3. Palette colors: The 46 pre-defined palette colors comprise 5 shades of 7 standard hues and 10 shades of gray, black and white. Palette colors are not editable (i.e they are not Named Colors) and are designed as a simple, limited selection of colors to apply to objects (either by dragging on to the object or clicking). If your document contains spot colors, they appear on the Color Line (and in the Color Gallery) as circles. Little markers in the color icons show which of the named colors (if any) or palette colors have been applied to the selected object(s). Diamond markers show the colors used by the selected objects. A diamond in the top-left corner indicates the fill color, in the top- right corner indicates the line color. Cross-shaped markers show the current color attributes if there are no objects selected. A cross in the top-left corner indicates the fill color, in the top-right corner indicates the line color. Triangular markers show the colors of a fill type if you have applied one (linear, circular, elliptical, etc). This works also when using the eye-dropper color picker. The color line markers update immediately and indicate the color of the object under the eye-dropper as you're dragging around. Copyright © 2015 Xara Group Limited, a MAGIX company. colors are the easiest and best method for simple documents that use relatively few colors. to change the color of an object without affecting other objects. that use relatively few colors. It's recommended to create a named color if you want to use the same color in different parts of your document and it’s especially useful, if there's a chance you might want to change that color in future. When you edit a named color, all objects that use this color are automatically and immediately updated to show the new color across all pages of your document. 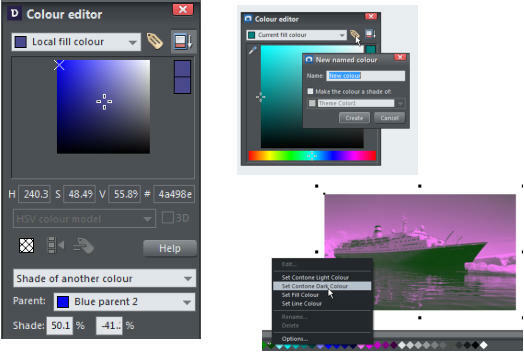 To do this, select an object whose color you want to use and then open the Color Editor ('Ctrl + E') and click the New named color icon (the label icon as shown below). Then give the color a suitable name and click ‘Create’. You will see the new color added to the Color Line. Creating a new Named color You can now apply this color to any object in the usual way, by drag- dropping it from the Color Line or just clicking (or right clicking to use it as a line color) to apply as the fill color. Many of the web themes offered in the Designs Gallery of Xara Web Designer and Xara Designer Pro include alternative color schemes which can easily be applied to websites that use the same theme, to transform the color scheme instantly. The color schemes are in the Designs Gallery in each theme folder, after all the page layouts and separate graphic elements that make up the theme. They all have 'Color scheme' in their titles, so are easily identified. To apply a new color scheme to your website, simply drag the scheme from the Designs Gallery and drop it on your web page. One of the color schemes matches the default colors used by that theme which allows you to easily return to the original colors if you prefer, after experimenting with the alternate schemes. Of course, you don't need to use the provided color schemes to re- color your website. You can customize the theme colors yourself and choose a combination of colors that you think work well together.